Hi Friends! 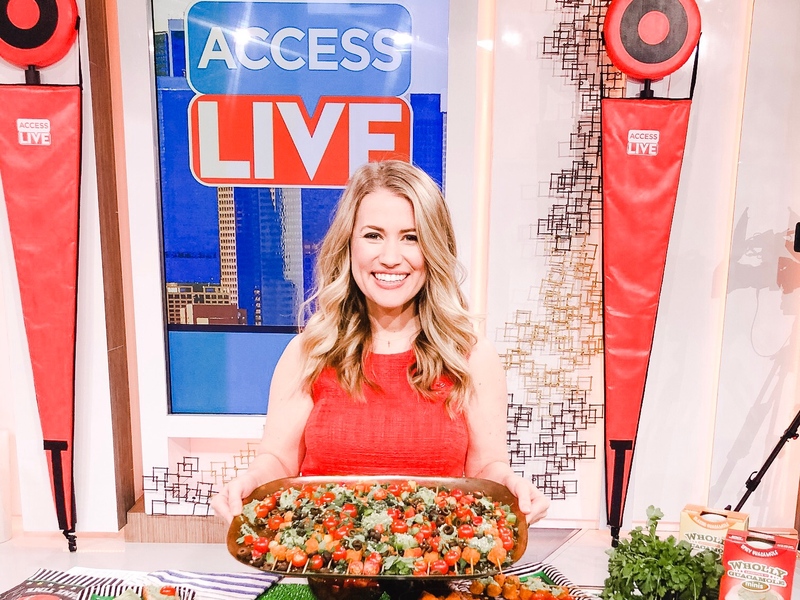 It’s not a game day party without guacamole and today I shared 3 easy recipes featuring Wholly Guacamole for the Big Game on ACCESS LIVE! I partnered with Wholly Guacamole as a media spokesperson for this segment and it was so much fun! Watch The Full Segment Below!! Wholly Guacamole makes it easy and hassle free to enjoy hand-scooped Hass avocados anytime, so there is no waiting for avocados to ripen or cutting one open only to find out it’s gone bad! Wholly Guacamole has so many great products to look for in store such as their easy peel-and-serve trays, snack cups, and Minis, all great for easy entertaining and perfect for the Big Game! They are available nation-wide and made with simple, real ingredients and absolutely no added preservatives! You can simply peel-and-serve the guacamole as is, pair with chips and veggies or add to recipes! Recipe one… mini bruschetta! With Wholly Guacamole there is no need to mash or prep avocado. Simply add a dollop of Wholly Guacamole on to mini toast, garnish with a tomato, fresh herbs, hemp seeds and that’s it! Recipe two… is loaded potatoes kabobs! Start with tater tot potato skewers and garnish with your favorite ingredients! I’m using Wholly Guacamole, tomatoes, cilantro, olives and pico salsa. Recipe three.. appetizer cups made with veggies and Wholly Guacamole Mini cups! It couldn’t be more simple and delicious! This post is sponsored by Wholly Guacamole.